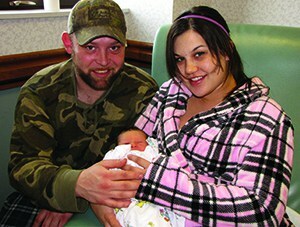 A record number of babies came into the world at Saint Francis Medical Center’s Family BirthPlace last year. One baby boy, however, waited until this year to greet the world. Hunter Glen Vanek, the first Saint Francis delivery of 2013, was born at 5:06 am on Jan. 1 to proud parents Tafawny and Andrew Vanek of Jackson, Mo. 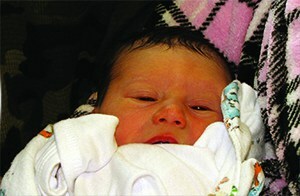 The six-pound, 13-ounce, 19.75-inch baby was delivered by Heather L. Cugini, MD, obstetrician/gynecologist at Saint Francis. The Vaneks received a special basket of baby items from Saint Francis in honor of their special occasion. In 2012, Saint Francis set a new annual record with 1,039 deliveries, breaking its record of 1,003 from the previous year. The latest record includes 19 sets of twins and one set of triplets. The Saint Francis nursing staff recalled many unique names given to children throughout 2012, but some names appeared more often than others. For girls born at Saint Francis in 2012, the most popular name was Emma; and for boys, Bentley and Easton. These names were followed closely by Avery, Isabella and Zoe for girls, and Aiden, Liam and Mason for boys. Names new on the list for 2012 were Journie, Landry and Oktober for girls, and Ryder, Jett and Lincoln for boys. The name Peyton was popular for both boys and girls.